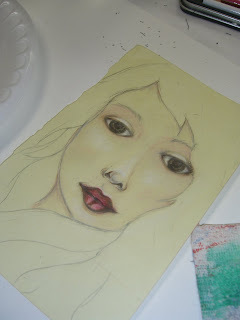 I have been really neglecting my blog but maybe it will cool down and I can concentrate on making art for giving away. Winner of my bottle fairy.....Alison Gibbs!!! Congratulations Alison, email me with your address and I will have her fly to you. Thanks everyone for leaving comments, come back soon. 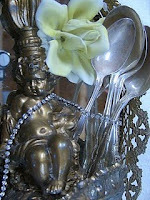 KC Willis of Lipstick Ranch is doing a giveaway for blogging about her Studio Retreats. 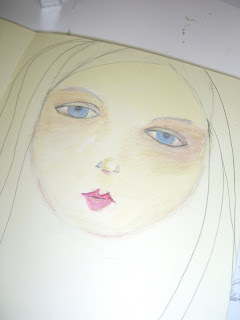 So, as a student of hers, I am blogging about it. Check it out...maybe you want to enter her giveaway. On September 5th KC will draw a name and I hopefully it will be ME :} For $300 worth of art of your choice from Lipstick Ranch. Fun. Check out her 2009 and 2010 workshop schedule here. 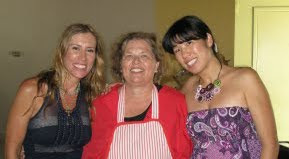 Guest Instructors like Joanna Pierotti and Sarah Fishburn (to name just a couple) will be teaching. 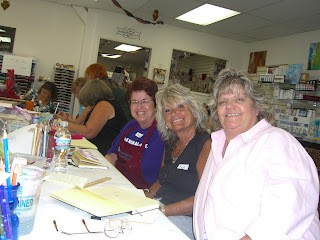 Workshops paid in full up front get 20% off and until the drawing is held September 5those same paid workshops get one night of their hotel free here in lovely Longmont, CO. If you are an international friend you probably won't make the trek to the US to attend a retreat...but you can take her online version at Collage Camp and you can get in the drawing too. Pass this on, blog about it and enter the drawing. 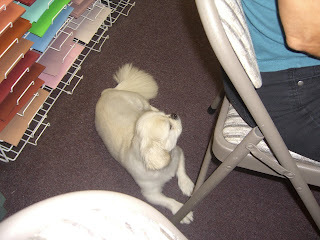 KC is a creative and talented artist.........we all need art in our life. This link will take you directly to the post for the latest GIVEAWAY. FREE Fairy in a Bottle. After posting a comment, just click on your BACK key to get back to reading my blog from the top. It was a fun Saturday at PaperTales. 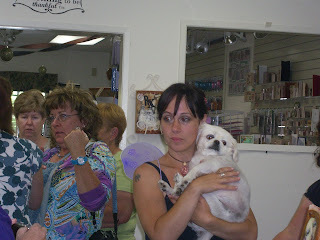 It was the first annual Trunk and Vintage Show two doors down from PaperTales Scrapbook Store. 28 vendors had vintage items and lots of great scrapbook items at great prices. The store that the event was held in is being remodeled into DADDIO's Hamburger joint....that should be fun and tasty. The ceiling was open with insulation showing and we had the front and back door open for a cross wind air conditioner and light but all and all it was fun and successful and can't wait for the next event. 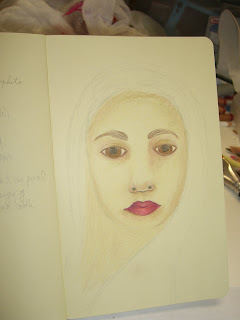 The other one is a Art Meetup Blog. 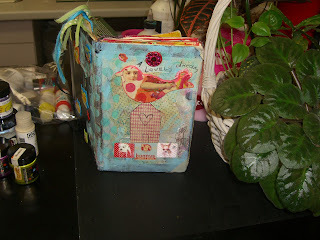 Each month I invite friends over to create and we come up with some great designs and fun. So check it out to see what we made in August. 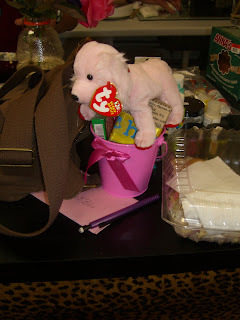 Don't forget to scroll down a couple posts (in THIS blog) to enter a FREE Giveaway. If you're in the San Diego area this weekend come on by Paper Tales as they are having their first ever Vendor and Trunk show. I will be a vendor selling bags of jewelry pieces, old Somerset magazines, german glass glitter and more. The ladies from the Barn in Temecula will be there with their amazing finds, Jane Pollack of Art Takes A Village will be there with her amazing art and jewelry, Elena of Scrapbook Royalty will be their with her cool purse hooks, original aprons and more. There will be 30 vendors selling all kinds of vintage and scrapbook items. This isn't your average run-of-the-mill scrapbook sale! Join us for a special sale and a special day. 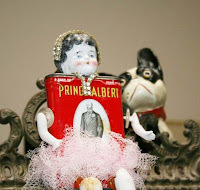 art, collectibles, jewelry, postcards, ephemera and more! The first 20 customers that day will receive a special goody-bag! ALL customers will receive a 10% discount that day at the store!! 3950 W. Point Loma Blvd. Hope to see you there. Stop by and say hi! Have a great day and check down 2 posts for a giveaway!!! My daughter-in-law emailed what follows in one of those chain letters, read it, pass it on to 5 others, etc, etc. When I read it, it brought a tear to my eye because it's true and I have felt that love and support in my life. Ten are peacefully sleeping on clouds. And one is reading her email at this moment. 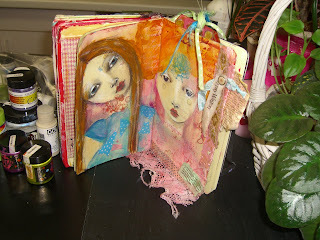 Suzi Blu's Art Journal..........oh you have to see this in person....so cute! 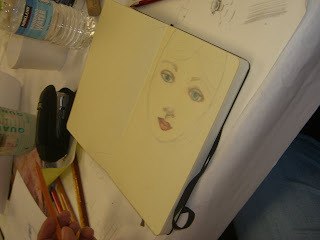 What a great way to spend a Sunday, a class with Suzi Blu showing us how to draw cute faces. 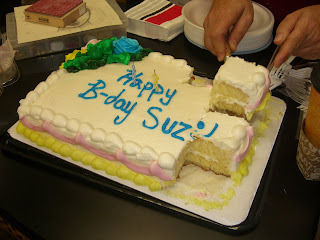 Now if you haven't heard nor seen Suzi Blu....YOU WILL!!!! 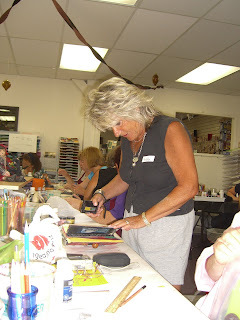 She will be in Somerset soon and her on-line drawing classes are fun, kitchy and full of great tips. This little lady with a New Jersey accent, a pink wig and a little white dog, GiGi, makes me and my friends laugh and giggle as we try to emmulate her. 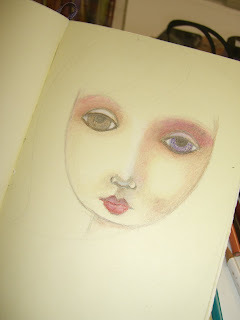 I'm not the best at drawing and don't pretend I will be in future but Suzi says forget all that "crap" and give it a try. 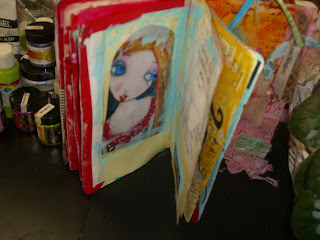 I wasn't the best in class but I felt like a had an "aha" moment knowing with practice I could get better cause she has a easy formula to make it work WITH PRACTICE and blends in mixed media to make your drawings and journals "pop". I seem to have been neglecting my blog for quite a while now but let's just say i was out Catching Fairies in a Bottle and leave it at that. I got one and want to give her away. Leave a comment and I'll be posting a winner August 31. Use what's left of the Summer to enjoy the HOT days and COOL nights.